Levon Aronian is one of few chess players with a 2800+ rating. (This select little group also includes Magnus Carlsen and Viswanathan Anand.) On the March 2014 FIDE rating list, Aronian was ranked number two in the world, with an Elo rating of 2830. Aronian is one of Armenia’s most prominent sportspersons, and he was awarded the title Honoured Master of Sport of the Republic of Armenia in 2009. 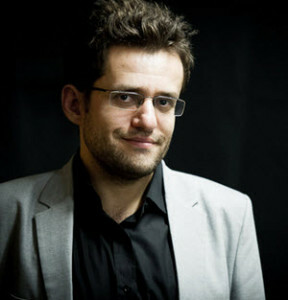 In addition to his great success in traditional chess competitions, Levon Aronian has also won the 2006 and 2007 Chess960 World Championship, the 2009 World Rapid Chess Championship, and the 2010 World Blitz Chess Championship. Levon Grigori Aronian was born in Yerevan on October 6, 1982. Yerevan is the capital of Armenia. (Back then, Armenia was a part of the Soviet Union.) His sister Lilit taught him how to play chess when he was 9 years old. His parents were Grigory Leontievich Aronov, a physicists, and Seda Aronova-Avagyan, a mining engineer. Levon Aronian’s father is Jewish. Aronian’s first chess coach was Grandmaster Melikset Khachiyan. In 1994, Aronian won the World Youth Chess Championship (under-12) in Szeged with 8/9. In 2002, Aronian won the Junior’s World Championship. Levon Aronian won the Chess World Cup in 2005. He also won the FIDE Grand Prix 2008-2010, which qualified him for the Candidates tournament for the World Chess Championship 2012. In the Candidates tournament, he was knocked out in the first round. Aronian was a part of the Armenian National Team that won gold in three Chess Olympics; the one in Turin 2006, the one in Dresden 2008 and the one in Istanbul 2012. He was also a part of the Armenian National Team that took home the gold medal at the 2011 World Team Chess Championship in Ningbo. At the time of writing (2015), Aronian is participating in the Chess Grand Tour, a series of three super tournaments in which players try to accumulate the most Grand Chess Tour points. The three super tournaments are Norway Chess, Sinquefield Cup and London Chess Classic. Aronian placed 9th in Norway Cup and won the Sinquefiled Cup.